The shipment of a 19-tonne gas-powered standby generator and a 17.6-tonne diesel generator on behalf of GEODIS Industrial Projects UK was moved from Châlons Vatry Airport in northeastern France to West Africa onboard one of the airline’s IL-76TD-90VD freighters. Each generator was housed inside containers measuring 920x260x290cms. 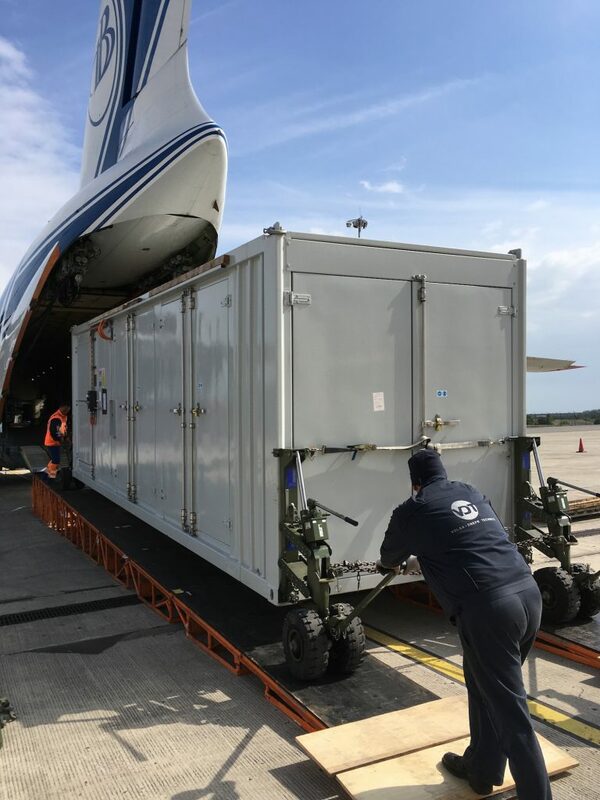 Volga-Dnepr invested in the special ‘wing lift’ system to reduce the usual four-hour loading time for 20, 30 and 40-foot containers onto its aircraft. It attaches wheels to each corner of containers fitted with ISO international standard fitting points, enabling the aircraft’s onboard loading systems to winch the container into the cargo hold safely and within a fraction of the previous handling timescale. Volga-Dnepr is a regular provider of transportation and logistics solutions for Power & Energy customers, carrying power generation, transmission and distribution cargoes as well as power plant components such as valves, heat exchangers and pumps. To date, the airline has operated over 1,430 flights delivering over 76,750 tonnes of such cargos and generates some 7% of its business from the provision of services to customers in the sector. Using the ‘wing lift’ system reduces the previous 4-hour loading process for 20, 30 and 40-foot containers to around 30 minutes.